Pneumothorax can occur as a complication of underlying lung disease. Careful history, proper evaluation with sputum examination, chest radiology, and bronchoscopy will establish the cause for pneumothorax in most of the cases. Cystic lung diseases can cause pneumothorax in young individuals. High-resolution computed tomography scan of the thorax correlated with history and physical findings will establish the diagnosis in cystic lung disease. We discuss a rare cause for pneumothorax in a young male. A 29-year-old male was brought to emergency department with sudden onset of breathlessness and left-sided chest pain for the past 4 hours. He had no other symptoms. He had no premorbid illness. Which of the following is least likely to cause sudden onset of breathlessness and left sided chest pain in a young male without any premorbid illness? Myocardial infarction with pulmonary edema. Aspiration pneumonia is least likely in a person without any premorbid illness. Most likely cause for sudden onset of breathlessness and chest pain in a young male is pneumothorax. Aortic dissection, pulmonary embolism, and myocardial infarction, all can occur in a young male when there is an underlying risk factor. He had no history of fever, hemoptysis, or weight loss. There was no history of fall, trauma, or injury. There was no history of allergic rhinitis, asthma, or tuberculosis (TB). There was no history of alcohol intake/addictions/substance abuse/convulsions/seizure disorder/aspiration. He had no predisposing conditions to develop pulmonary embolism. There was no history of hyperlipidemia/family history of ischemic heart disease at young age. He had started smoking at the age of 15 years. He smoked two packs of cigarettes daily. General physical examination was normal. Respiratory rate was 28/min. Oxygen saturation while breathing room air was 92%. Heart rate was 104/min, regular, and had all features of left-sided pneumothorax. Which of the following physical sign is not seen in pneumothorax? In pneumothorax, vocal resonance will be decreased as air is bad conductor of sound. Amphoric breath sound may be heard in pneumothorax when there is bronchopleural fistula. Bronchopleural fistula is common in pneumothorax which occurs due to rupture of a cavity or emphysematous bulla. What is the next investigation for this patient? Computed tomography (CT) scan of thorax. The first investigation in a suspected pneumothorax is CXR. Thoracic ultrasound can detect small pneumothorax. This is useful in patients in Intensive Care Unit where anteroposterior film may miss a small pneumothorax. 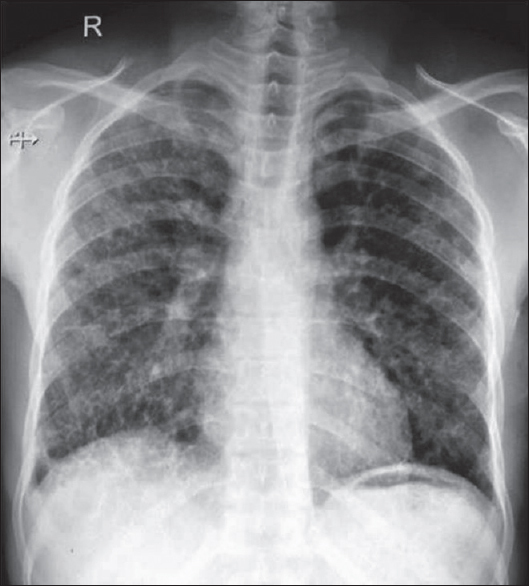 CXR showed left-sided hydropneumothorax with reticulonodular lesions on both sides with cystic lesions in both lower zones [Figure 1]. 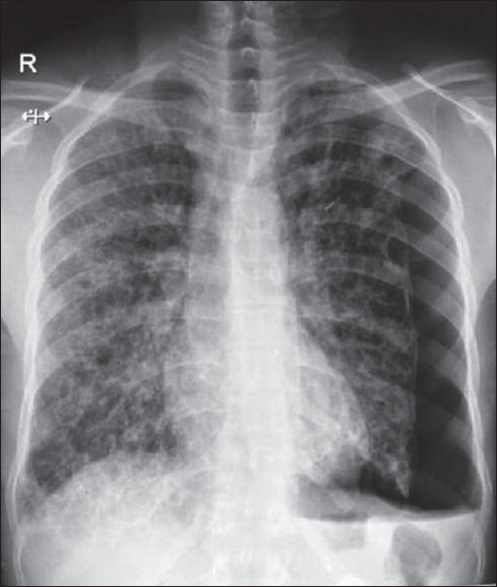 Which of the following is not a radiological sign in pneumothorax? Air bronchogram occurs only in lung parenchymal disease, not in pleural disease. An area of hypertranslucent lung field at the periphery which is devoid of bronchovascular markings, bounded medially by collapsed visceral pleural margin with shift of mediastinum to opposite side, is the characteristic radiological finding in pneumothorax. Which of the following is least likely to cause pneumothorax with the above radiological findings? Viral pneumonia does not lead to cavity formation or cystic lesions, and pneumothorax is least likely in viral pneumonia. 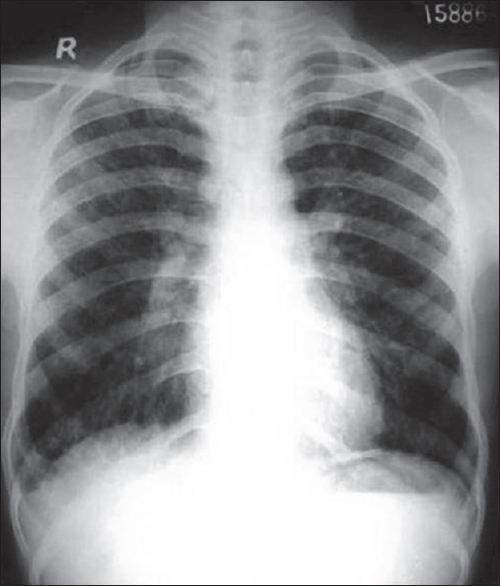 TB is the most common cause for pneumothorax in a young patient with bilateral lung parenchymal shadows in the CXR. Pneumonia by Staphylococcus aureus can lead to pneumothorax due to rupture of pneumatocele. Cystic lung diseases can lead to pneumothorax. Long-standing P. jirovecii pneumonia can lead to cystic lesions in CXR and pneumothorax. What is the next step in the definitive treatment for this patient? Since the patient is symptomatic, next step is to drain the air by inserting intercostal tube. 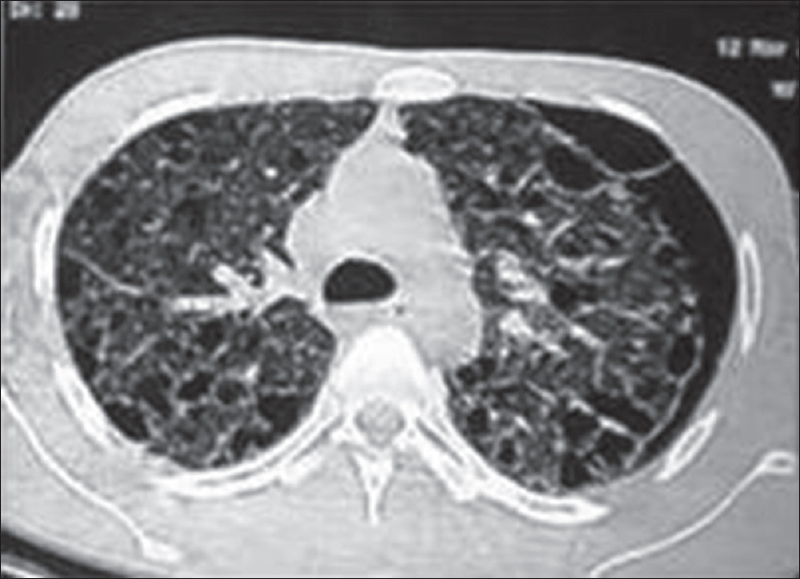 In a collapsed lung, CT scan may fail to detect lesions. Hence, HRCT scan of the thorax should be done after expansion of the lung to find any underlying lung lesion as the cause for pneumothorax. Sputum smear examination for AFB should be done as TB is the most common cause for pneumothorax with CXR showing bilateral lung parenchymal lesions with this sort of CXR in India. Needle aspiration should be avoided in secondary spontaneous pneumothorax as most often it fails and may lead to surgical emphysema. Thoracic ultrasound may not yield any additional information in this patient. Intercostal tube drain was put. The patient was better and his dyspnea reduced immediately after intercostal tube drain. CXR after intercostal tube drain showed expansion of the lung. Bilateral reticulonodular shadows in both lower zones persisted [Figure 2]. Total leukocyte counts, erythrocyte sedimentation rate, blood urea nitrogen, and blood sugar were normal. Peripheral smear showed eosinophilia (16%). HIV by ELISA was negative. Sputum Gram stain did not show any organisms. Sputum culture did not grow any organism. Sputum for AFB smear was negative. Further evaluation was done as sputum AFB smear was negative. What is the next investigation in this patient? HRCT scan thorax should be done in spontaneous pneumothorax cases after intercostal tube drain once the lung expands. HRCT scan is helpful in determining the cause for pneumothorax and to find underlying lung disease if any. Features suggestive of cystic disease of the lung with left-sided pneumothorax [Figure 3] and [Figure 4]. Which of the following is least likely to cause cystic lung disease? Lymphangitic carcinomatosis does not lead to cystic changes in lung. Bronchoscopy was done to rule out TB and other infective diseases. Bronchoscopy was normal. Bronchial washings showed numerous bronchial epithelial cells and squamous and few pigment-laden macrophages. Few inflammatory cells were seen. Bronchial washing culture did not grow any organism. AFB smear and culture from bronchial washings were negative. 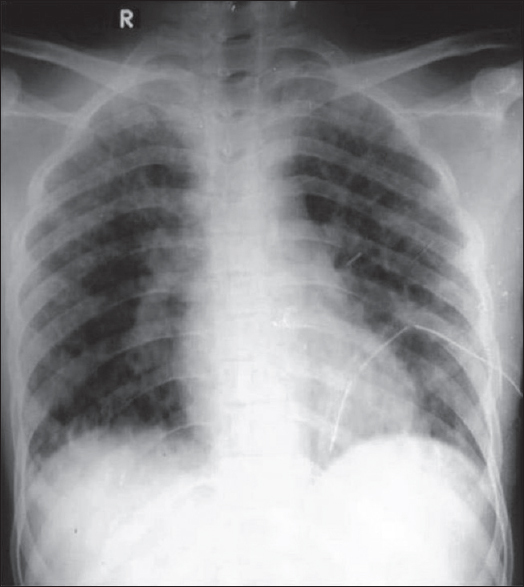 Spontaneous pneumothorax is observed in 15%–20% of cases of PLCH. In a young adult smoker with a typical nodulocystic HRCT pattern, a presumptive diagnosis of PLCH is acceptable with a close follow-up. Lung biopsy was not done in this patient as HRCT was typical of PLCH. Lung biopsy is indicated when the diagnosis is uncertain. Bronchoscopy was done to rule out infective conditions which may mimic PLCH. He was started on oral prednisolone 30 mg/day with symptomatic treatment. PLCH occurs predominantly in adult smokers. Smoking cessation is advised for all individuals as it is known to stabilize the clinical course of the disease. He was counseled for smoking cessation. Pneumothorax resolved. Intercostal tube was removed after 8 days. He made uneventful recovery. Steroid was gradually tapered and stopped after 6 months. He did not smoke further. Repeat CXR after 3 months and 6 months showed considerable resolution of the lesions [Figure 5] and [Figure 6]. Juvenile xanthogranuloma (diagnosed in children and adults). Both these are macrophage disorders. Langerhans cells are white blood cells in the immune system that normally plays an important role in protecting the body against viruses, bacteria, and other invaders. They are found in the skin, lymph nodes, spleen, bone marrow, and lungs. In LCH (formerly known as histiocytosis X), Langerhans cells multiply abnormally. Instead of helping to protect the body, these cells cause tissue injury and destruction, especially in the bones, lungs, and liver. In most cases, LCH that affects many body systems typically occurs in children younger than 2 years, whereas single-site disease may occur in people of any age. LCH is a dendritic cell disorder which results from clonal proliferation of immunophenotypically and functionally immature, morphologically rounded Langerhans cells along with eosinophils, macrophages, lymphocytes, and occasionally, multinucleated giant cells. LCH may involve a single organ (single-system LCH), which may be a single site (unifocal) or involve multiple sites (multifocal), or LCH may involve multiple organs (multisystem LCH), which may involve a limited number of organs or it may be disseminated. Some forms of the disorder are genetic. The Langerhans cell, a differentiated cell of the monocyte-macrophage line, is the pathologic cell type of PLCH. It is distinguished by pale staining cytoplasm, a large nucleus, and nucleoli. On electron microscopy, classic pentalaminar cytoplasmic inclusions or Birbeck granules (X-bodies) are seen. Which of the following structures are not involved in PLCH? Major airways are not involved in PLCH. Most common symptoms in PLCH are nonproductive cough and exertional dyspnea. Some patients may be entirely asymptomatic and present only with an abnormal chest radiograph or present with pneumothorax as in this case. Spontaneous pneumothorax can occur in PLCH and tends to recur and may be bilateral. Chest pain in a patient with PLCH may also be due to rib involvement. Fever, weight loss, and malaise are seen in a minority of patients with PLCH. Signs of pulmonary hypertension and cor pulmonale reflect advanced disease. PLCH may be associated with pulmonary hypertension, which is often more severe than the extent of lung parenchymal disease. Direct involvement of the pulmonary arterioles and venules by the disease process appears to account for this phenomenon. Diffusing capacity for carbon monoxide is reduced in PLCH. The most common extrapulmonary features in PLCH patients are cystic bone lesions, diabetes insipidus from posterior pituitary involvement, and skin lesions. Which is not a HRCT feature in PLCH? Characteristic HRCT features in PLCH are bilateral and symmetrical, predominantly upper, and mid-lung zone, nodules up to 1 cm in size. Nodules are often irregular in appearance and with more advanced disease may extend into the lower lung zones. The costophrenic angles are typically spared. With disease progression, reticular and cystic changes may be observed, and nodules may regress. Lung volumes are typically normal or increased. PLCH is one of the few lung diseases associated with increased interstitial markings and normal or increased lung volumes. HRCT may be diagnostic in PLCH, particularly when a combination of cysts and nodules in a characteristic upper lung zone distribution is observed. If this pattern is seen in a patient with a typical history, lung biopsy is frequently not required to make the diagnosis. When only nodules or only cysts are present, the differential diagnosis is broader. Cysts alone may be due to pneumatocele (e.g., from P. jirovecii infection), lymphangioleiomyomatosis (LAM), or bronchiectasis. Differential diagnosis of the upper zone nodular changes of PLCH includes sarcoidosis, silicosis, TB, or metastatic disease. These latter diagnoses are typically associated with perilymphatic or random distributions of the nodules rather than the more typically centrilobular distribution of PLCH nodules. PLCH cysts are usually irregular in shape and are believed to be formed from the coalescence of nodules. As with nodules, sparing of the lung bases is the general rule. Advanced PLCH may progress to honeycombing and fibrotic changes. Transbronchial lung biopsy (TBB) has traditionally been considered to have a low yield in the diagnosis of PLCH – a finding confirmed in a recent series of 102 patients with PLCH diagnosed by surgical lung biopsy. However, TBB is useful mainly in the exclusion of other disorders such as sarcoidosis, which may be in the differential diagnosis. In cases in which diagnostic uncertainty remains (e.g., a young woman with mainly cystic lung lesions in whom LAM is a consideration), surgical lung biopsy is appropriate. Electron microscopy can reveal the presence of Birbeck granules, a finding that is specific for LCH cells. Birbeck granules are cytoplasmic, tennis racquet-shaped inclusions. Owing to the lower cost and greater efficiency of immunohistochemistry, electron microscopy is no longer routinely used for the diagnosis of PLCH. PLCH is associated with an increased risk of both lung cancer and hematological malignancies, continued smoking being a major risk factor. The major causes of death in PLCH are respiratory failure from progressive disease and malignancy. Corticosteroid therapy should be reserved for symptomatic patients with predominantly nodular lesions on HRCT scans. Corticosteroids are most likely to be beneficial at this stage of the disease in which inflammatory, rather than fibrotic, lesions are present. Corticosteroid dose used in PLCH is 0.5 mg/kg/day to 1.0 mg/kg/day tapered over 6 to 12 months depending on the response to medication. Ringstrom E, Freedman J. Approach to undifferentiated chest pain in the emergency department: A review of recent medical literature and published practice guidelines. Mt Sinai J Med 2006;73:499-505. Tschopp JM, Rami-Porta R, Noppen M, Astoul P. Management of spontaneous pneumothorax: State of the art. Eur Respir J 2006;28:637-50. MacDuff A, Arnold A, Harvey J, BTS Pleural Disease Guideline Group. Management of spontaneous pneumothorax: British Thoracic Society pleural disease guideline 2010. Thora×2010;65 Suppl 2:ii18-31. 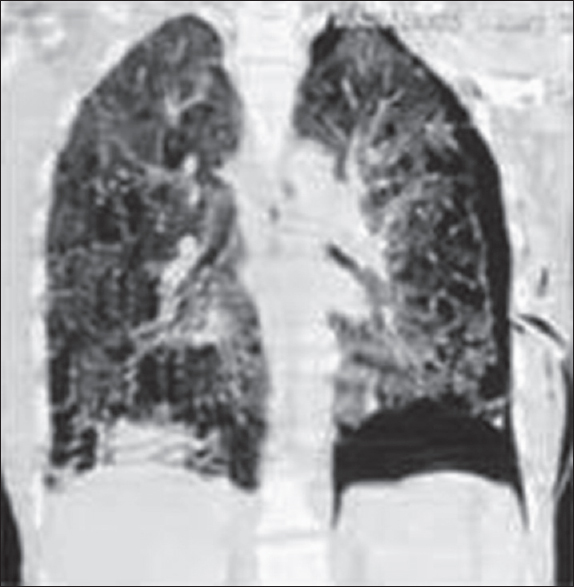 Ferreira Francisco FA, Soares Souza A Jr., Zanetti G, Marchiori E. Multiple cystic lung disease. Eur Respir Rev 2015;24:552-64. Lorillon G, Tazi A. How I manage pulmonary Langerhans cell histiocytosis. Eur Respir Rev 2017;26. pii: 170070. Juvet SC, Hwang D, Downey GP. Rare lung diseases III: Pulmonary Langerhans' cell histiocytosis. Can Respir J 2010;17:e55-62. Bande U, Madakari C, Kusubi P. Pulmonary Langerhans' cell histiocytosis - case report. International Journal of Biomed Res 2013;4:187-9. Brauner MW, Grenier P, Tijani K, Battesti JP, Valeyre D. Pulmonary Langerhans cell histiocytosis: Evolution of lesions on CT scans. Radiology 1997;204:497-502. Housini I, Tomashefski JF Jr., Cohen A, Crass J, Kleinerman J. Transbronchial biopsy in patients with pulmonary eosinophilic granuloma. Comparison with findings on open lung biopsy. Arch Pathol Lab Med 1994;118:523-30.